I originally bought a gender neutral car seat because I was SURE at some point in my life I would have sons and daughters. After finding out that I was having my 4th DAUGHTER in a row and that this will likely be our last (due to complications this pregnancy) I decided to go ALL out girly with this child! I didn’t want to spend the money on a new car seat though since the one I had was still perfectly fine. I was excited when my sister told me about the Carseat Canopy’s Whole Caboodle set that could cover my neutral car seat and turn it into PURE GIRLY bliss! So what does this 5 piece set include and how does it work? Let me show you! 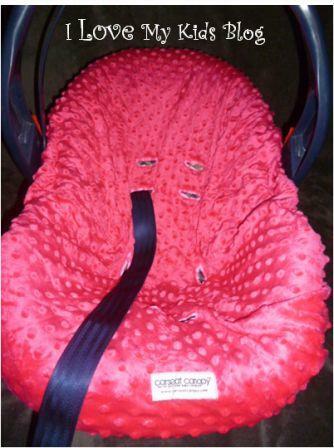 The Whole Caboodle comes with a minky fitted slip cover that fits most rear facing infant car seats. 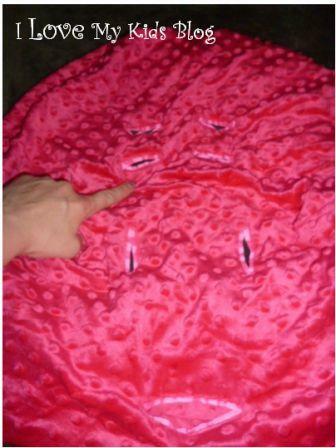 You can see that there are several openings so this slip cover can be used to fit properly over your existing padding on your car seat. 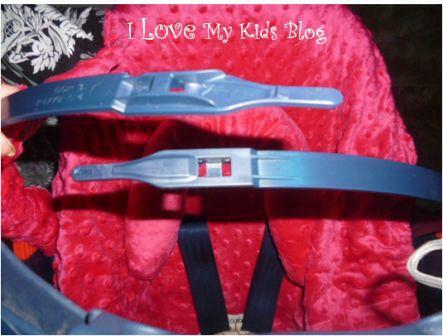 To put the slip cover on the car seat, un-thread the straps through the car seat. Place the stretchy slip cover over and line up the slits. Re-thread the straps through the car seat. It is getting cuter already-why didn’t I do this 3 kids ago? There are so many things I already love about this slip cover. 1) It is so unbelievably soft, I LOVE minky material! 2) I love the idea of a slip cover, especially when she gets a little older and starts snacking in her seat, how easy will it be to take that off and clean it up?! 3) It is so GIRLY! With the whole caboodle you will also receive a head support cushion. This company really though through their design. It has Velcro slits so you can easily attach and detach it as needed. Nice! 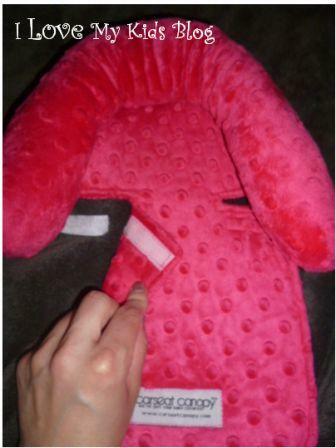 The head rest is also made out of the soft minky fabric and has a nice full cushioning for the head support. I can’t wait to put my new baby in here-it looks so soft! The 3rd piece in the set is an umbrella in a contrasting print to match a couple of the other pieces. There is tubing that allows this umbrella to maintain it’s shape with only using the original arch support of your car seat. I found it was a bit longer than my original umbrella, which I am very excited about, because the original one never really blocked my babies from the sun completely. I’ve been a Mom for quite a while and have had a lot of experience with car seats but had NO idea the original umbrella could be completely removed. The Whole Caboodle came with clear written instructions on how to put them on the car seat and then a website address to view a video if you are still stuck. If you slide your original shade to one side you will see a snapping mechanism on the arches that you simply un-click to remove the shade. Who knew, right? 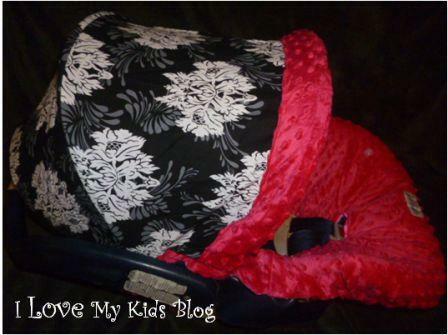 The 4th piece that comes with the car seat canopy whole caboodle is a lap blanket. Also done in the same soft minky fabric and contrasting fabric. The best part about all of these pieces, they are all machine washable! Easy to use and easy to care for! 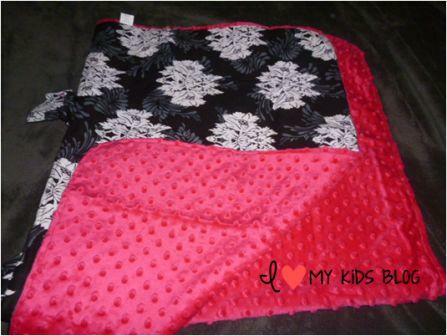 The lap blanket is just the perfect size to wrap around your safely buckled little one! Finally the 5th piece is the car seat canopy itself. 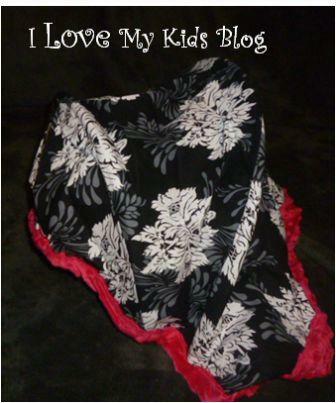 It has the soft minky interior and cotton on the outside. The car seat canopy attaches to your car seat’s handle with hidden Velcro so the wind won’t take that “cover blanket” away anymore! If you hold up the car seat canopy via the tabs you will see one side is a bit shorter than the other side, the shorter side goes to the back, the longer side in the front. Plus it has those really adorable buttons on the top adding to it’s girly-ness! The length is just perfect, it isn’t too long that it will drag on the ground, but it isn’t too short, ensuring that my baby will remain covered and out of the elements! If you are still stuck after following the written directions (or mine even) Here is a link to the instruction video. It is really easy to follow! Are you ready to see the before and after of my car seat? Ahhhh I LOVE it! It is indeed lovely just as it’s name states! 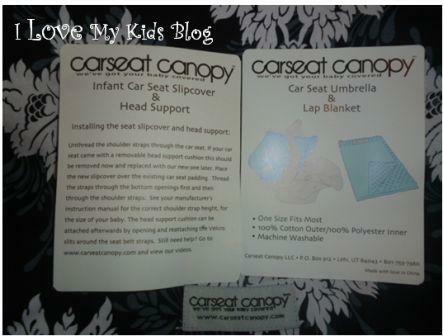 You can even add embroidery for just a $6 more via the Carseat Canopy website! I love this option, but since this is our 4th daughter we are having a hard time agreeing on yet another girl name. The Whole Caboodle by Carseat Canopy generally retails for $135, but is on sale for $79.95. On their site you can occasionally find coupons and discounts making it even cheaper! To stay up to date with the latest news at Carseat Canopy you can follow them on Facebook, Instagram, Pinterest, & YouTube. Carseat Canopy offers way more than “The Whole Caboodle”. 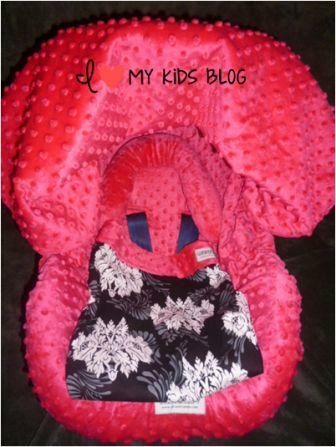 They have several sites full of awesome baby things to make life as a mom easier! 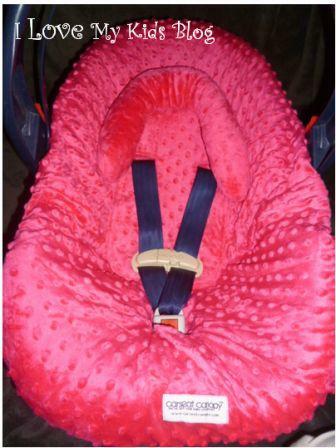 In fact, if perhaps you are happy with your current car seat but would like a canopy I’ve been given a code where you can score the car seat canopy itself for free, you just pay shipping (ONLY $12.95). Awesome, right? Click the banner below to score this sweet deal! BUT WAIT-it gets better! If you do want to have the whole caboodle, apply the same coupon code for the whole caboodle (4ILOVEMYKIDS) and it will take $50 off your whole caboodle making it only cost $29.95 plus shipping! WOOOOOOOOT! 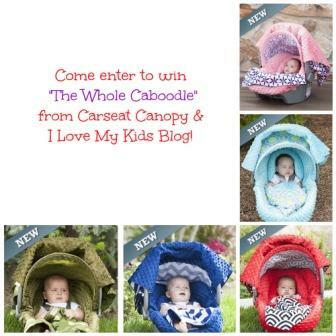 Carseat Canopy has graciously offered to give one of my readers “The Whole Caboodle” of their choice! This giveaway is open world wide and will end at 11:59 est on 6/17. 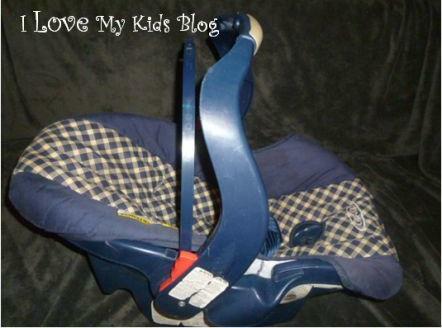 This giveaway is for fans (new or old) of the Carseat Canopy Facebook page…make sure you are a fan so you can enter! The winner will be notified via email and have 24 hours to reply or a new winner will be chosen! To get your name into the drawing please fill out the form below! Good luck! If you do want to have the whole caboodle and weren’t the winner, you can apply the same coupon code for the whole caboodle 4ILOVEMYKIDS and it will take $50 off your whole caboodle making it only cost $29.95 plus shipping! WOOOOOOOOT! Disclosure: I received the whole caboodle mentioned above to try out and get an opinion to share with you. Regardless of our arrangement I was not pressured into posting a positive review and all opinions mentioned above are my own. Some affiliate links are present in the article above. I would get the LOVELY WHOLE CABOODLE for my sister. She is having her first girl and it would be perfect for princess MIA. I would get LOVELY WHOLE CABOODLE for my sister. She is having her first girl and it would be perfect for princess MIA. I like the jagger set! I would get the The bold navy blue and white zig-zag design on the Jagger Canopy make this print stand out. Navy blue minky dots the interior. LOVE IT!!!!! I would get the Noah Whole Caboodle for my niece’s baby. It’s adorable. I’d get Kennedy or Knott. I don’t know which I like more. I love the lovely whole caboodle!! I absolutely love the lovely whole caboodle!! I absolutely love the lovely whole caboodle!! Thank you so much for the chance to win! I absolutely love the lovely whole caboodle!! Thank you so much for the chance to win!! I absolutely love the lovely whole caboodle!! Thank you so much for the chance to win. Such a awesome pize. I apologize for the multiple comments. It kept saying my comment couldn’t post then a ! I would like to win, an I would pick the Kendra or the one that you picked. Thanks for this great giveaway! My favorite is the Angelina. That is what I would pick if I won. I would choose the Kennedy cause it looks like it could be Boy or Girl for my grandchild on the way. I would get the Belle Whole Caboodle. I love the chevron! I would get this for my new son who is due at the end of august! Noa, and Hayden would be my toss up, but I think ultimately I would have to go with Noa! Thank you so much for this opp.. Hubby and I have been eye balling these since we found out I am finally pregnant after 8 years of trying, and after stocking up on everything else, this has yet to be an option! I would get the Chevy Whole Caboodle. I love the color combo and the design! I’d love the Jagger or Kennedy for a boy and Mikayla or Kendra for a girl. I really love the “Kendra” my favorite two colors are Pink and Purple! I would get the Belle one. It’s so cute and my angel’s name is Belle. I would love to get the Jagger Whole Caboodle! I LOVE the chevy whole kit and caboodle! I can’t wait to receive this if I win! I’m a first time mom and I fell in love with these canopies! I would pick the Hunter whole caboodle! i have a little nephew due in Sept! I would love Tyler, joger or salomon whole cabodle for my new born. I love Tyler, joger or salomon whole cabodle for my new born. I’m due in 8 weeks. And I have my sons caraway to make over for our unborn daughter. I loved the Kendra style. It’s so cute. I would definitely choose that! I’m due in 8 weeks. And I have my sons carseat to make over for our unborn daughter. I loved the Kendra style. It’s so cute. I would definitely choose that! I’m due in 8 weeks.I loved the Kendra style. It’s so cute. I would definitely choose that! I’m due in 8 weeks.I loved the Kendra style I would definitely choose that! I love the pretty and playful colors of the kendra! I will be having a baby boy in about right weeks, and like CJ have always had a gender neutral car seat. As this will most likely be our last…I’ve thought about making it a little more boyish!! 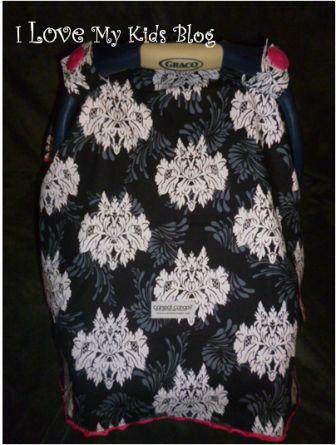 I just purchased the “Noa” car seat cover…but would LOVE THE WHOLE CABOODLE!! 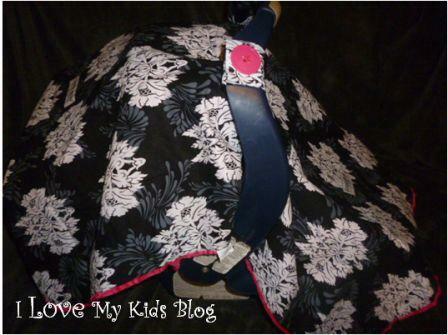 I just purchased the “Noa” car seat cover…but would LOVE THE WHOLE CABOODLE!! Having a boy! Would love the Noa!! I really wish people would do a little more research into these. They are highly flammable and extremely unsafe to use. If you read the manual for your carseat, they manufacturer even tells you not to use these. They may be cute, but by using them, you are putting your child’s life in great danger. And this car seat is like 20 years old I am so confused..
How did you un-click the umbrella arches? I can’t figure it out? What brand of car seat do you have? I found a video online for my graco car seat that showed me, have you searched YouTube? How do you clean the umbrella top with the plastic bones in it?